Exceptionally large and serene lacquer antique Buddha dressed in royal robes, intricately inlaid with inset flat glass/mirror mosaics backed with colored foil and further decorated with moulded relief work forming beautiful spirals. The Buddha is seated in "bhumisparshamudra" (subduing Mara); his left hand rests palm upward, on his lap, and the right hand rests on his right knee, calling the Earth to witness. He has elongated earlobes to demonstrate his princely parentage, and a very kind, pleasing face with gently smiling lips. Ideally suited for strong impact/exhibit. Good condition, there are no obvious losses and no repairs. The pinpoint hairlocks are inconsequentially worn here and there and the "Ushnisha" flame removable, probably from a later date, as is typical of such venerated images. 19th Century, Shan State, Burma. Needs a large space for display. Size: H. 190cm x W. 135cm x D. 85cm, stepped base is included. Definitely one-of-a-kind and only available by sea freight for international orders (about 6 cubic meters). Also shown on our homepage. 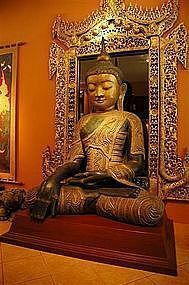 Magnificent gilt carving behind Buddha is sold separately, please inquire. *** Detailed information on the origin and technique of making such lacquer images/figures can be found under item # 928838. Thank you.